An ecosystem is a community of living organisms, along with non-living things like air, water, and soil that interact in order to sustain the health and prosperity of the system as a whole. The members of an ecosystem strike a delicate balance, a circle of life, if you will, that repeats itself in every forest, ocean, lake, desert, swamp, and stream that you might come across on earth. Because of an Acorn (ISBN 1452112428) a picture book written by Lola M. Schaefer and Adam Schaefer and illustrated by Frann Preston-Gannon is a book about that balance. In very few words, the authors communicate the interconnectedness of the different populations within an ecosystem. It starts with an acorn becoming a tree and then a tree becoming a home for a bird and on and on until we come full circle. This book is based on the ecosystem of the Cumberland Plateau. The forest is drawn in browns, grays, and every shade of green possible. The bright orange, yellow, blue and red of the fruits, and flowers and the bird complement the earthy colors of the rest of the pages. You can almost smell the soil and the leaves and the rain. It is an animal eat animal world and although no animal is pictured eating another animal, it is clear that a chipmunk is eaten by a snake and a snake is eaten by a hawk. 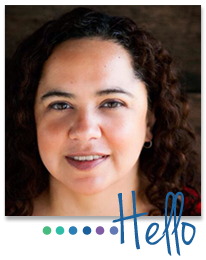 The authors communicate their message about the interdependence that exists in nature clearly and concisely. They do this in an engaging, almost lyrical way that informs the reader about ecosystems and food chains while conveying a deeper message. The book also reminded this reader that we humans are a part of this chain as well. We are not only connected to each other, our fortunes are also tied to the health of the ecosystems that surround us. The back matter includes includes some background information about white oak trees, acorns, forests, and animals and includes tips on how we can help to conserve our forests. 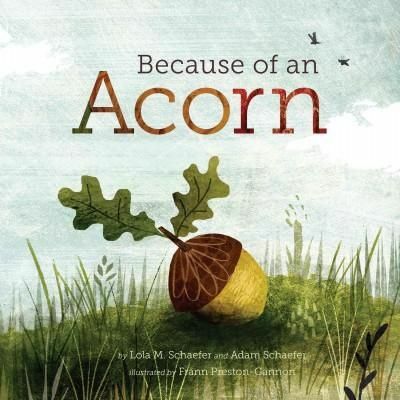 Because of an Acorn would be a great addition to a unit on ecosystems and food chains.